Here is what we have been doing in math for the last couple of weeks. We moved up to the numbers 16-20 and I think we got lost! It is a work in progress. We start everyday with the counting circle. Currently, we are counting forward to 100, backward from 20 (wow is that hard to do), and counting on to 20 starting from numbers other than just 1. I also use this time to go around the circle and flash subitizing (1-5) cards to the kids. They love the counting circle. We have been using life-size 5 frames to make sets of 16-20 objects and to determine how many groups of 5 are in the set. We are also working on cardinality (knowing that the last number you count is how many are in the set). I had students help me model on the large five frames, while everyone else used their towers of cubes. We talked about how we knew each filled 5 frame equaled 5 objects and why. We also started counting on at 5 and 10 because we knew that one 5 frame made 5 and that two 5 frames made 10. After students made a set of cubes they broke them into groups of 5 to see how many groups of 5 were in the number. 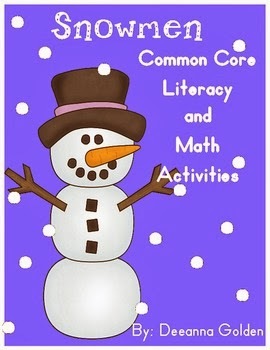 We used some activities from Deeanna's Snowman, Common Core Literacy and Math Activities unit. We used q-tips and white paint to count and make sets of "snowballs." We used the snowman poem in the unit for adding, joining, and counting. We added one more to make a new set and we figured out what the number would be if it was one less. My favorite activity from the unit was a snowball fight where we compared sets of snowballs to determine which side had more or less. I can't seem to find the pictures from this though. My kids had tons of fun with it and it was something different for working on greater than/less than. We made sets of snowflakes using ten frames and recorded the numbers. We glued down the first ten snowflakes and added on and counted up each time. To switch things up, we used the ladders from Kim's Fire Fighters unit as 5 frames. I modified her buckets of water math game. We made sets of "buckets" on the ladders and recorded the numbers on dry erase boards. We also made two sets and compared them to see which number was greater. I enlarged Kim's recording sheet so we could fill it in as a whole group. For each set of buckets we made, we determined how many groups of 5 were in the set. Then we figured out how many more buckets we needed to make another set of 5. For instance, if we made a set of 17 objects we determined there are 3 groups of 5 in the number 17 and that if we added 3 more we could make another group of 5. 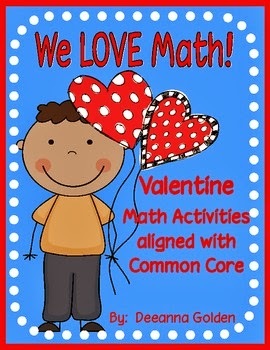 We used these numbered hearts from Deeanna's We Love Math, Valentine Math Activities Aligned with Common Core to practice counting on. We started with a different number each time. Students had to be able to recognize the number on their heart and know when they needed to line up. The unit contains a recording sheet for this activity, but we need to get a little better at it before we start trying to record. This lesson's focus for nonfictional text features was bold words, fancy letters, colored words, and headings. We zoned in on a firefighter's gear and tools for this lesson. Each student chose the piece of gear or tool they wanted to write about. Everyone started their sentence with "Firefighters have" then they add a bold printed word for the part of gear they chose. The they wrote a sentence about why firefighters use that particular piece of gear or tool. Before drawing their firefighter they added a heading with fancy letters and colored words. Again we talked about how nonfiction illustrators use these features to teach us new information and show us what is important. We also talked about why headings and these types of words can be helpful to the reader. In advance, I typed up in dark bold print the words boots, pants, coat, helmet, gloves, and tools. For headings, fancy letters, and colored words I found a font my students could color in. We added the heading before drawing the picture. We just wrapped up our study of day and night and are moving on to patterns of events in seasons now. Here are the final things we did with day and night. We made a Venn Diagram to compare things we do during the day, things we do at night, and things we do during both. You can download the pictures for the Venn here. Since we have been use firefighters to learn about nonfiction text features, we use the books Snowmen at Night and Snowmen at Work to think about "What do Firefighters do at Night." I was going to use a Double Bubble thinking map instead of a Venn Diagram, but then I was not sure if my students would be able to come up with very many things that firefighters only do at night. It would have worked out with the Double Bubble though. The book Big Frank's Fire Truck is one of my favorite books about firefighters. 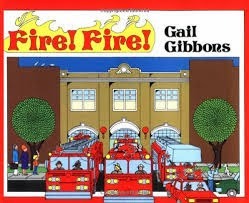 It is perfect for showing students an example of a 24 shift and what firefighters do during the day and night. We reviewed the large flow map we made last week. Then we made our own flow maps to show the position of the sun and the moon as it moves throughout the day and into the night. We focused on the pattern of the movement throughout the day. Here are a few more links for day and night. You can find more of my posts on lessons for day and night here. You can download the individual day and night flow map from google docs here. You can find my day and night unit on TPT here. This week we are continuing on with our study of nonfiction text features. This is the Scholastic book we used last week when we made our anchor chart. This book is great for bringing out examples of all of the different nonfiction text features. On Monday we focused on the text feature of labeling. We used the labeling activity from Kim's Fire Fighters Unit for our lesson. We talked about why nonfiction illustrators use labeling. Then we worked as a whole group to label the firefighter. After we practiced as a whole group, students went to their seats and practiced labeling on their own. On Tuesday we used Kim's Parts of a Fire Engine activity to focus on close-ups and cut-a-ways. We reviewed how nonfiction illustrators use text features to teach us something new or to show us something that is important. We learned about the parts of the fire engine. Then we wrote about the parts and created a close-up with a label to go with our writing. We started each sentence together with "Fire engines" then we added are, have, or can together. Students finished up writing each sentence themselves with their own idea and their own spelling. They decided what part of the engine they wanted in their close-up. Then they created it and added a label. I have to say I think they did a great job with this lesson and they are really starting to see and think more about nonfiction text features. Still to come this week- bold printed words, fancy letters, and colored words as well as captions and fun facts. 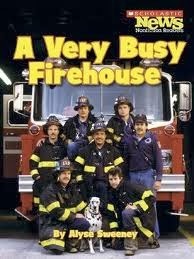 You can pick up Kim's Fire Fighters unit here on TPT. This week was DEAR week in our district so we ended our week with a visit from a special reader. 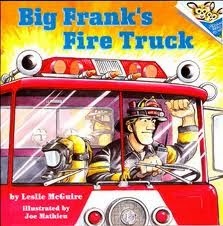 My sweetie, known to my little ones as Firefighter John, visited our classroom and read books to us about firefighters. I used John's visit as a springboard into our study on informational text. Here are the books John read. They are a mix of fiction and nonfiction texts. 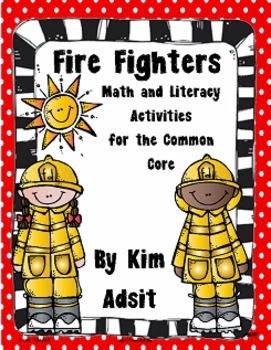 I used a Scholastic nonfiction book about firefighters and Kim's Diving In unit for this lesson. First I read the book and we used labeled arrows from Kim's unit to label the nonfiction text features in the book. Kim's unit has a great piece on flamingos that can be used for this lesson. 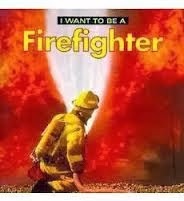 I wanted to connect it to what we were already doing so I used the book about being a firefighter. After reading the book, labeling the non-fiction text features in it, and working with a partner to find examples of the features we made this anchor chart. All of the words and labels came from Kim's unit. I used examples from the firefighter book for our chart. 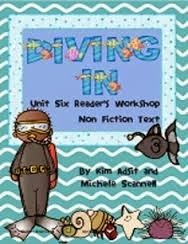 Next week we are going to continue on through the Diving In unit and add on to it using Kim's Informational Writing unit. On a more personal note, I just celebrated my 42nd birthday with an amazing surprise birthday weekend that made it the best birthday ever. I am very thankful to be 42 and to get to go to work each day and teach the little ones in my class. In ELA we are working on making predictions. 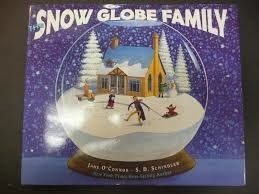 Today we used the book The Snow Globe Family to make predictions. There are several great places for stopping and making predictions throughout the book. I love the predictions we made when we got to the last page. We kept the lesson simple since we were focusing on making predictions. There are lots of cute ideas and units on Pinterest and TPT for using this book. You can check some of them out here on my Pinterest board. What's the "Dirt" on Soil?